The day started well for Lewis and he found himself in second place for much of the session, towards the end of qualifying his times started to drop off due to tyre wear and the team only had 6 tyres for the weekend unlike some of our rivals who carried over new tyres from previous rounds. At the end of qualifying Lewis was in a very respectable 4th place with only 0.441 of a second covering the top four and only 0.118 of a second between 2nd and 4th. As a team, we were very pleased. Race 1: Lewis began 4th on the grid and following another great start, found himself battling with Dan Lloyd for second place on the first lap. Despite contact between the two cars, both survived before further contact with another car along the back straight. After lap one Lewis was in 3rd place chasing Dan Lloyd with Josh Price on Lewis’s tail, as the race progressed Dan took the lead from Olli Taylor and Lewis opened up a 3 second lead over Josh Price. In the final laps Lewis was the fastest man on the circuit closing the gap on the leaders and leaving 4th & 5th behind, unfortunately the gap was too big for him to close and Lewis crossed the finish line in a very credible 3rd place. Race 2: With a reverse grid for race 2 Lewis began in 7th place. Another fantastic start saw him go from 7th to 2nd by the time he got to druids bend but it would appear that we had used all our luck in race 1 as Lewis soon started to slip back because of tyre wear and after racing in 6th place for much of time his tyres finally gave up and he had to enter the pits on lap 28. 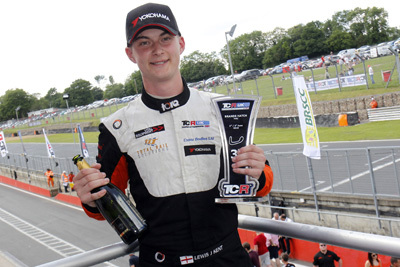 The team at Essex & Kent Motorsport sprang into action as he came in and within 2 mins had him back on the track with different rubber on both fronts, he finished in 7th place setting his fastest lap on the last lap proving that good tyres make a huge difference. After the race an inspection of the tyres showed that they had delaminated just as they did in the last round at Knockhill. Lewis now moves up to 5th place in the Championship which the team are very pleased about. However, we can’t help but keep wondering where would we have been if we hadn’t had the tyre problems at the last two meetings. 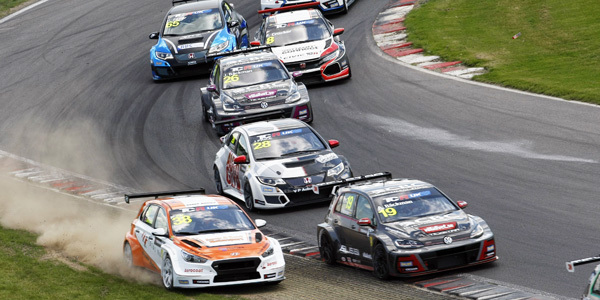 This entry was posted in Race Reports, TCR UK and tagged Brands Hatch, Essex & Kent Motorsport, Lewis Kent, TCR UK, TCR UK Touring Car. Bookmark the permalink.